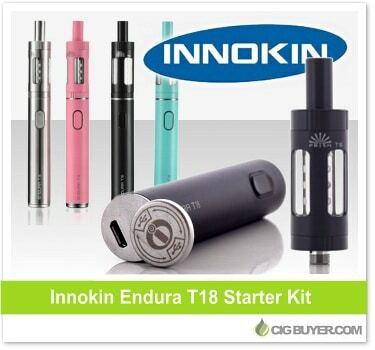 Here’s a product designed specifically for beginners – the Innokin Endura T18 Kit. It combines a 1000mAh EVOD-style battery with a 2.5ml top-fill tank to create a compact and easy to use setup for just about anyone. No complex controls or OLED screen, a single button controls all of the settings while an illuminated LED ring changes color to indicate battery level. Available in several different colors, it’s similar to the EVOD’s of the past but provides up to 14W of power and offers a quality tank with replaceable “no-spill” 1.5 ohm coils.